When you are given the privilege of capturing a wedding, you have to pre plan all of the photos that you need to create for your clients for that day. The details are important, however the couples individually must have their portraits created in a very different style for me that is a must. On this day when I walked in my clients house in Palmetto Bluff, I realized that not only the bride was beautiful but she happened to be wearing one of the best wedding dress designed by the famous Haley Page. This dress features a Alabaster purple plum airy gown, with a halter high neck with crystal bodice, and the chapel train. Lets just say this dress is amazing, to top that of was the bride who’s hairdresser did a spectacular job with her hair as you can see. 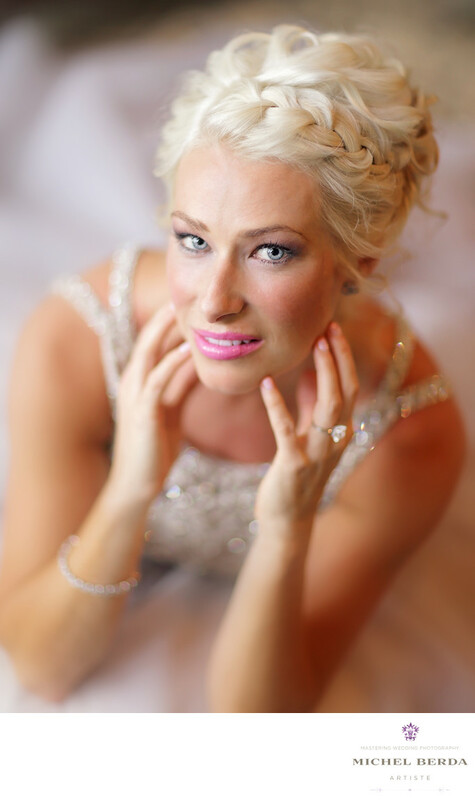 To make this image pop and reflect exactly what I saw, I used my favorite lens with a very shallow depth of field, and concentrated my lighting technique to be very reflective of the beauty of the bride and this image. Keywords: bride (66), groom (69), palmetto bluff (6), photographer wedding palmetto bluff (3), plametto bluff (3), wedding photographer palmetto bluff (3).